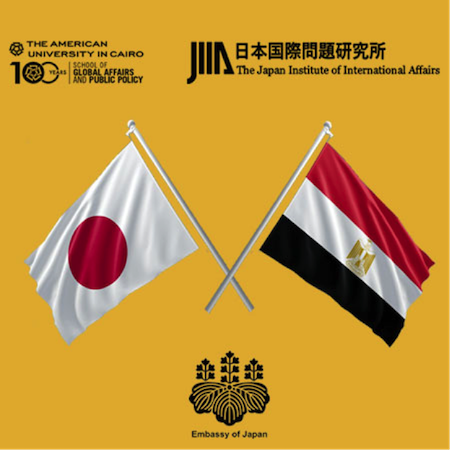 The School of Global Affairs and Public Policy, The American University in Cairo (AUC) and The Japan Institute of International Affairs (JIIA) have the pleasure to invite you to "Egypt-Japan Cooperation in the Evolving Strategic Context of Middle East and Asia" in commemoration of AUC's centennial and supported by the Embassy of Japan in Egypt. The event will take place on Tuesday, February 5, 2019, at 9 am, at Alf Leila We Leila-A, the Nile Ritz-Carlton, Cairo. To RSVP please fill the online form here. The event will be in English with a simultaneous interpretation in Arabic. For inquiries and more information, please contact us at mesc@aucegypt.edu.